Captain! The ships taking on Water! 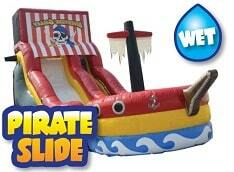 Your crew will go overboard for this awesome 18ft Pirate Waterslide. Riders scale the pirate ladder to the slide platform then slip and slide down the cool, wet slide to splash pad at the bottom! This bright, colorful slide is designed to resemble a pirate ship with a mast complete with two flags, a prow on the front and waves, portholes and anchors all along the sides. The platform is encased in mesh for safety and has a red and white striped cover featuring a pirate skull and crossbones! Looking for the dry version of this slide? 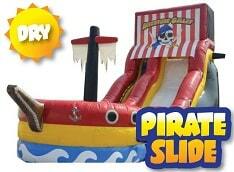 Check out our Dry Pirate Slide!